When To Plant: Charley recommends planting tomatoes in mid to late April, but experienced gardeners can plant earlier and protect the young plants with buckets and milk jugs or start them out in a cold frame or small greenhouse. One unique method of planting early is to fill a wheelbarrow up with potting soil and star your plants in it. That way you can wheel them in and out as need to protect them from cold snaps then transplant the large plants in the garden later after the danger of frost has past. Click here to see a video from a friend of ours explaining how he does this (he learned from his grandpa). Planting Tip: You can take tall tomato plants and lay them horizontally across the ground and cover the roots and the plant with dirt, but leave the top 6” or so uncovered. The tomato plant will root along the stem that is buried and the uncovered part will grow upright in a few days. This is a good way to get early tomatoes. Average Yield: 250 pounds per 100 foot row or about 3 1/2 pounds per plant. Tomatoes do best when they are planted in the garden by transplants or starter plants like Charley’s Vegetables in mid to late April in Arkansas after the frost free date. If you are starting your own transplants from seed, sow the seeds six weeks before you want to plant. (You can back that date up about a week going south and add a week going north for every 100 miles you go.) Planting earlier than mid April will most likely require you to cover your tomatoes at night to protect them from frost. If you want fall tomatoes, you will need to make a planting in early July. The advantages of a fall tomato planting are increased vigor, less rick of early diseases and better quality tomatoes (sometimes). Preparation and Care: To prepare your garden for tomatoes, fertilize the soil with a complete fertilizer at a rate of 3 pounds per 100 feet of row. Since most home gardens are not this big, this converts to about 1/2 ounce per foot of row. You can also use the “Charley Method” and scatter 1 handful across 2-3 feet of row and work it into the soil prior to planting. After you have planted your tomatoes, apply a general purpose water soluble starter fertilizer. Watering: Water your garden (tomatoes and everything else) once a week with a 8-12 hour soaking. This will allow the soil to absorb an adequate amount of water and also limit the time you spend each week watering. If you use a sprinkler to water, do this during the day so that the plants will have some time in the evening to dry out before dark. This will limit the chances of disease. If you use a soaker hose, you can water at night. Watering with a soaker hose at night is best as it limits the amount of water lost to evaporation and keeps the plants dry which limits the chances of disease. During dry periods you may need to water more often (every 4-5 days), and watering at night is important in water conservation during droughts. Fertilize: When your tomatoes reach about 1 1/2” in diameter, side-dress them with 1 tablespoon of ammonia nitrate per plant then repeat 3 and 6 weeks later. Make sure this fertilize is absorbed into the soil by side-dressing before a rain or before you water. Be sure not to get any of the fertilizer on the leaves. 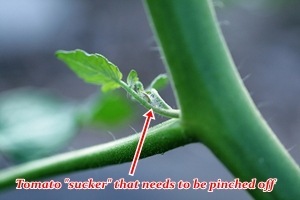 Staking and Tying: Tomatoes plants are actually vines and require support to keep the upright. You can support them by staking and tying or with cages and trellises. Using trellises and cages is straight forward. Tall cages will probably need to be supported by stakes and the tomatoes will need to be loosely tied to trellises with a soft twine or cloth. Staking tomatoes requires stakes to be driven into the ground between every third or fourth plant. When the plants reaches about 12-14” tie them off with tomato twine. Here is a video of how to tie them off. As the tomatoes grow, tie them off about every 6” or as needed for support. Pruning: Staked tomatoes are usually pruned and are therefore taller than un-pruned plants, hence the need for more support by staking or cages. Pruning involves removing the suckers and limiting the plant to the top two main stems. Suckers are the small stems that grow from between where a leaf attaches to the stem. Pinch off all lower suckers by hand when they are 1-2” long. You will need to prune several times. Be care not to remove developing flower clusters (future tomatoes). Indeterminate varieties will keep growing as long as the weather is warm and will require more pruning and taller cages or stakes. Determinate tomatoes stop growing after 5-7 clusters of tomatoes. Harvesting: Tomatoes mature depending on variety between 55 days (early varieties) and 105 days (late varieties). Harvest tomatoes when they are fully ripe and firm (most varieties will be dark red). Pick tomatoes every day or at least every other day. 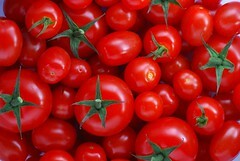 The best tomatoes are grown and harvested when the day temperatures are about 80 degrees. Immature tomatoes can be harvested green for frying, pickling or used in relish. Place mature harvested tomatoes in the shade. Mature green tomatoes can be picked when desired and ripened indoors at 70-75 degrees. Store ripe tomatoes at 40-45 degrees and 90% humidity for 7-10 days OR put them in your crisper in your refrigerator and eat them before they start growing fuzzy stuff on them. Temperatures of 90+ degrees will adversely affect tomato production and quality.